While the World Cup edges closer to coming home, it’s been raining new Premier League football kits already this summer. Although we’re only in the beginning of July, we’ve already seen a stunning range of kits from the likes of Nike, Puma and adidas, as the biggest clubs in the world start gearing up for a challenging new season. In fact, Manchester City began their preparations even before the end of last season. After winning the Premier League title at an absolute canter, Pep’s ‘Shark Team’ decided to show off their new home strip in their final home game of the season against Brighton. The Citizens eased to a 3-1 win in that particular game, so the omens are already looking good ahead of the 2018/19 season. This sneak-peek gave us a good sense of what City will look like as they attempt to clinch their fourth Premier League title in 8 years. With no club being able to defend their title since Manchester United back in 2009, City will have their work cut out to emulate the success of their rivals a decade ago. However, after last season’s form, you’d be crazy to bet against them. Either way, Pep and his men are going to need everyone to get behind the club if they hope to defend their title. 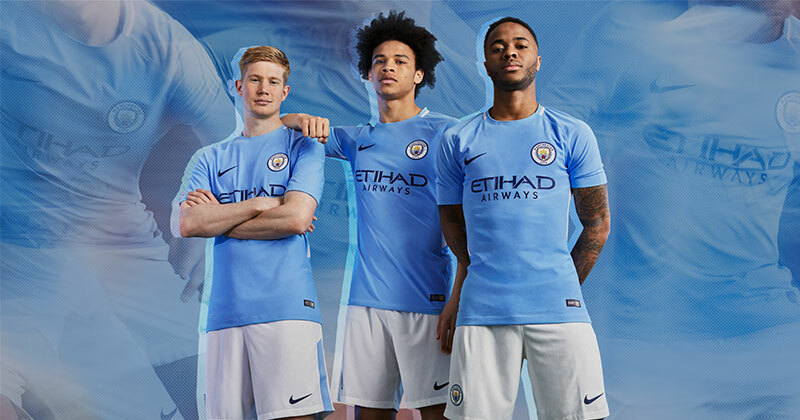 Of course, this will involve getting your hands on one of the new 2018/19 Man City kits, but how is it different from last season’s design? This year, City’s home shirt is all about the sleeves, just as many of Nike’s new football kits are. The shirt inevitably features a traditional sky-blue colourway (anything different would no-doubt cause uproar), while the sleeves are injected with deeper shades of blue to create a blurred-stripe pattern. The new graphic adds a bit of depth and style to last year’s shirt, which was a much plainer and simpler sky-blue design. The 18/19 City shirt also incorporates a buttoned V-neck collar, which has the iconic ‘Blue Moon’ phrase stitched inside and offers a completely different look to last year’s kit. Nike have also made use of their innovative Vaporknit technology, with the stretchable yarn designed to improve breathability and prevent the shirt from clinging to the body. Of course, it’s details like this that can prove the difference and turn title-challengers into title-winners. Perhaps more notably, the new Man City kit sees the return of navy socks, which haven’t been worn since City were battling it out in the old Division 1 and 2. The 1998/99 season, in particular, is seen as a pivotal moment in the club’s history, since promotion that year began their journey to the Premier League and the famous Mansour takeover. Now 20 years later, City will be showing off their navy socks against United, Liverpool and Chelsea, instead of Macclesfield Town and Lincoln City. The return of these socks serves as a stark reminder of how much City have evolved in the past two decades, and that it wasn’t so long ago that the club was in a very different position indeed. Now arguably the most frightening side in European football, we wonder if the new Man City kits will bring even more success than last season’s Nike strip. Either way, don’t forget that you can compare prices on all your favourite Premier League football kits right here at FOOTY.COM.